So, troublesomekeen, I assume your message means you're not beta-testing, right? I just want to make sure, since if that's the case, then I can send the beta to Roobar if no one else wants to test it out. Hello, everybody! I know it's been a while since this site had a news update; I've been rather busy lately. Today's Christmas, though, and I thought I'd wish you all a Merry Christmas, as I had a nice one this year! I got some nice gifts and had a good time with my family overall. Anyway, with that said, I'd like to talk about The Mortrix. Now, what's The Mortrix, as you might be wondering? Well, it's the name of the Keen 2 mod I showed in the previous update, which is... *ahem* FINISHED!! That's right, the mod is complete... but before you go to the Mods page to check, I want to say that The Mortrix isn't released yet! It's currently being beta-tested by biffstudly and troublesomekeen, two members of the PCKF, an amazing Keen fan community! Feedback has been rather positive, with praise especially going to the huge variety of graphics and level content, which is nice to hear! Variety is one of the things I aimed for in this mod, as I tried to make each level feel distinctive in terms of graphics, layout, and content. 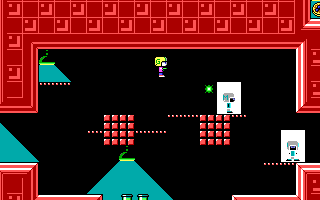 As you might have guessed it, Commander Keen's arch-nemesis, Mortimer McMire, has a sneaky trick that he has fallen for. 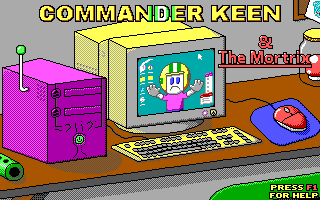 Keen's computer, the Doscom, has sucked himself in after being infected by a virus! The Maltimers, glitchy-looking soldiers that have been seen in a couple screenshots above, are roaming around the computer, messing up stuff and trying to get rid of Keen once and for all! It'll be quite a journey for Keen, as he tries to wipe out the virus itself! So, that's all for now! Keep in mind that there is much more in The Mortrix that hasn't been shown yet; I just don't want to spoil everything in the mod. I'm looking forward to the day The Mortrix is released, which has still not been set yet. Anyways, Merry Christmas! 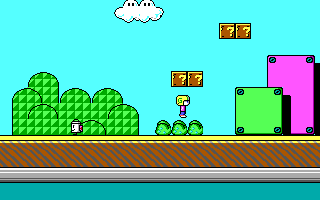 Keen enters Level 1-1 of Super Mario Bros. 3!! Very cool, looking forward to this! Ooooh that looks cool, especially the title screen there. Is that a Mario mushroom in a jar? Dang, this looks seriously awesome. I may have to give it a go when it's ready to, well, go! Thanks for the replies, guys! It's really nice to see the kind words for the mod. That mushroom is supposed to be the same mushroom Keen took in The Morticore (my previous Vorticons mod), although it was inspired by the mushrooms from Mario. Speaking of The Morticore, if you were to look to the left of the same screen, you'll find the green flute that was taken in said mod as well. Can't wait! Thanks for the new screens. The title screen looks cool -- and I can never understand how anyone has the patience (and skill) to draw the full keyboard. Holy mackerel! what a promising title screen. I love visual storytelling and this one is bodacious! Or inside the monitor screen. Wow, that's a brilliant idea, Nisaba and Roobar! 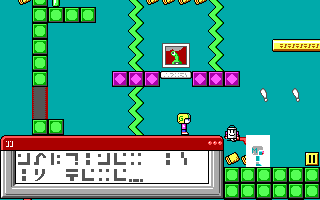 I added the "F1 for help" text into the monitor screen, and I think it looks good!